Do Hidden People Play Football? Enigma no. 4: Do Hidden People Play Football? 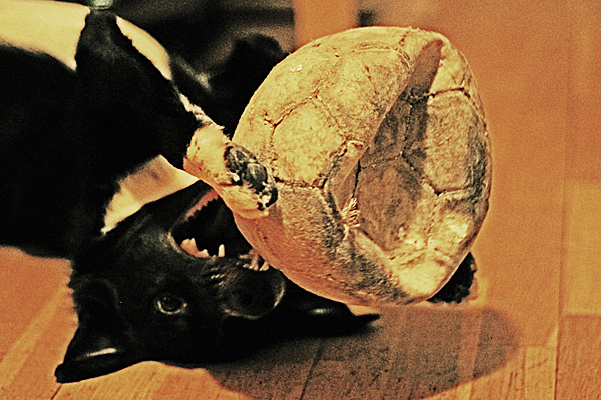 Kátur is not a picky dog when it comes to balls: he will play with almost anything, even if it’s not spherical at all. He’s a very pragmatic fellow. For him, tennis balls are nice because they easily fit in his mouth, so he can taunt you when you accept to sacrifice your whole afternoon to ball-throwing. Footballs are excellent for more intense outdoors physical activity, which includes running around in circles, sprinting and jumping — not that he doesn’t try that in our sitting room as well. Our neighbors used to keep a bunch of old footballs in the garden, not usable at all for human standards, but very appealing for a dog. Being Kátur one of those dogs that for idiosyncratic reasons beyond human imagination put their whole being into the appreciation of ball-playing, he was more than happy that those balls were at his disposal and, it goes without saying, he was not very concerned those were not his own playthings. After having played enough with the neighbors’ footballs, to the point of reducing them to a state that made them resemble more to a dead hippo’s stomach than to items designed to entertain people, Kátur was probably certain of being their rightful owner. I was also quite sure no human would have wanted to touch those revolting objects anymore. So we were all very shocked to notice one day the balls were gone. We thought at first their real owners had thrown them away, but this wasn’t the case. Whatever the reason behind the disappearance, Kátur was very unhappy when he realized he couldn’t play anymore. In winter finding a football in Reykjavík can be very difficult and thus we couldn’t replace Kátur’s possessions. A couple of months or maybe more passed and nobody was thinking about the infamous footballs anymore. Kátur in the meantime had devoted himself to full-time indoors ball-playing. Today, as we were taking a walk in the neighborhood before dinner, I saw something strange emerging from under a bench. It’s a bench we see frequently in our walks and I hadn’t noticed anything unusual before. I got close to the bench, and to my surprise one of the disfigured balls that had disappeared from our garden was there. Dirty and more shapeless than ever. How it ended under the bench, I cannot fathom. Since we are in Iceland, it may be the hidden people took a fancy to it and then got tired and left it there. Kátur didn’t seem to care. He wanted to take the ball home and wanted to carry it himself, although this meant he couldn’t engage in other activities, as catspotting and sniffing at random. The ball is here now and it’s frankly quite disgusting to look at. But unless hidden people come to claim it back, I doubt we’ll be able to get rid of it very soon. Kátur has obviously found true meaning and value in his dog world. So many other dogs struggle for years to find spiritual completeness. He must be greatly admired by his peers. You know Jon, I think what you said is true and even transcends the dog world, hehe.